Platinum is a transition metal that is highly valued for jewelry and alloys. Here are interesting facts about this element. It's difficult to assign credit for the discovery. Ulloa 1735 (in South America), Wood in 1741, Julius Scaliger in 1735 (Italy) all can make claims. Platinum was used in relatively pure form by the pre-Columbian Indians. Six stable isotopes of platinum occur in nature (190, 192, 194, 195, 196, 198). Information on three additional radioisotopes is available (191, 193, 197). Platinum has a melting point of 1772 °C, the boiling point of 3827 +/- 100 °C, the specific gravity of 21.45 (20 °C), with a valence of 1, 2, 3, or 4. Platinum is a ductile and malleable silvery-white metal. It does not oxidize in air at any temperature, although it is corroded by cyanides, halogens, sulfur, and caustic alkalis. Platinum does not dissolve in hydrochloric or nitric acid but will dissolve when the two acids are mixed to form aqua regia. Platinum is used in jewelry, wire, to make crucibles and vessels for laboratory work, electrical contacts, thermocouples, for coating items that must be exposed to high temperatures for long periods of time or must resist corrosion, and in dentistry. Platinum-cobalt alloys have interesting magnetic properties. 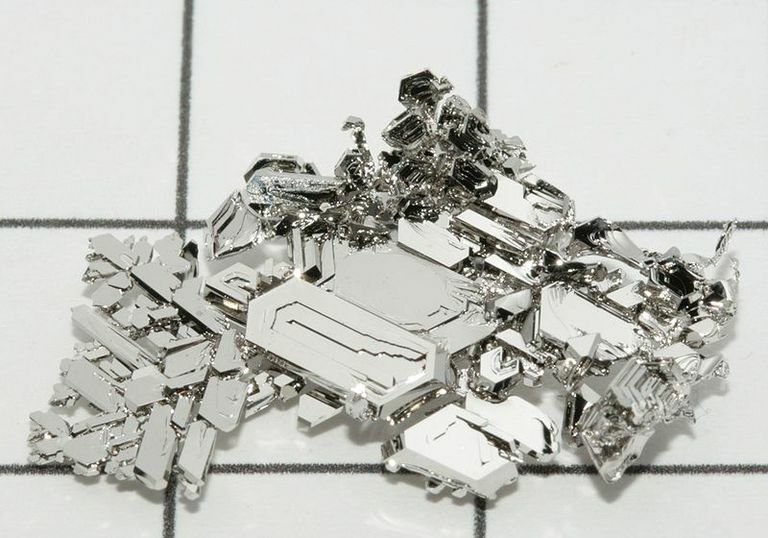 Platinum absorbs large amounts of hydrogen at room temperature, yielding it at red heat. The metal is often used as a catalyst. The platinum wire will glow red-hot in the vapor of methanol, where it acts as a catalyst, converting it to formaldehyde. Hydrogen and oxygen will explode in the presence of platinum. Platinum occurs in native form, usually with small amounts of other metals belonging to the same group (osmium, iridium, ruthenium, palladium, and rhodium). Another source of the metal is sperrylite (PtAs2).